Our mobile payment solutions provide optimal convenience for property managers and residents alike. 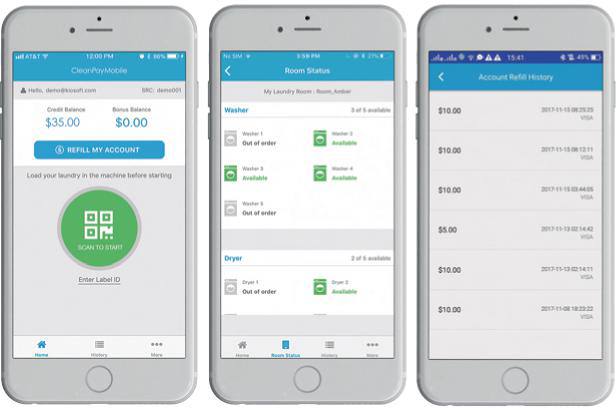 We offer the innovative CleanPay Mobile system, as well as our exclusive new mobile app, SudKick. Both are free mobile downloads with secure, easy-to-use payment options powered by Kiosoft. Download the free mobile app, which is available from the Apple App Store and Google Play. Register and add value to your account. Users can set up an account in minutes and securely store payment information, eliminating the need to carry cash or cards. Our mobile apps also allow users to manage their account from the palm of their hand – check account balance, remotely view machine availability, start washers and dryers, view transaction history, and set up clean alerts for when laundry cycles are complete. Invaluable to property managers, our secure mobile payment solutions eliminate the need for laundry room attendants, change machine upkeep, and rolling quarters. Plus, property managers can remotely access revenue tracking tools and transaction reports. These mobile payment solutions connect directly to your machines through CleanReader Solo and Solo Connect. Download the app from the Apple App Store or Google Play. Simply search “SudKick” or “CleanPay Mobile” based on your laundry room’s designated availability. You can also scan the QR code located on the sign in your laundry room to get started. Tap the “Refill My Account” button on the main screen in the app. Log in to your account, enter your payment information, and select an amount to add. The funds are automatically placed in your account. Yes! SudKick and CleanPay Mobile transactions are SSL encrypted by your smartphone when connecting to our PCl-certified transaction host. The account balance is on the main screen. For your convenience, balances are updated in real time. There is no Internet connection. Will my phone still work? Yes. Mobile devices connect to the machines via Bluetooth. As long as you have enough money in your account to start a cycle, you’re ready to go. What is the Smartphone Registration Code (SRC)? Each facility is identified by a unique code. Simply type in the code or scan the QR code, which can be found on the sign in your laundry room. (Example SRC code: alvOOOl).